The name Sibyl comes from the ancient Greek word Sibylla, meaning prophetess—a woman who interprets divine messages. 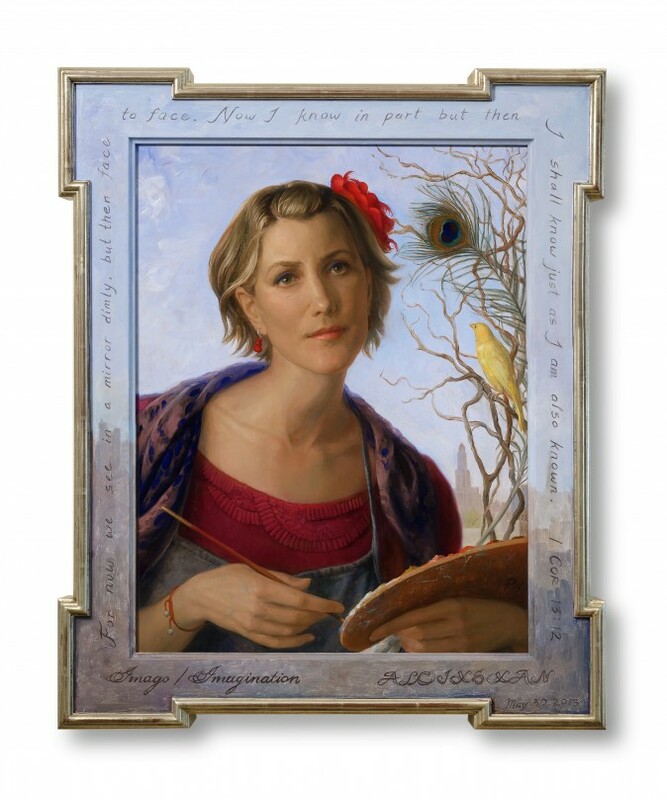 Like the many Sibyls as well as other female mythic figures she paints in contemporary settings, Watwood takes on the role of the artist as a messenger. She uses myths and creates allegories. Her paintings tell stories. “Art at its best taps into a wellspring of inspiration of what connects us as human beings to a larger sense of the world,” Watwood said in her home, in a former furniture warehouse she renovated with her husband in Park Slope, Brooklyn. 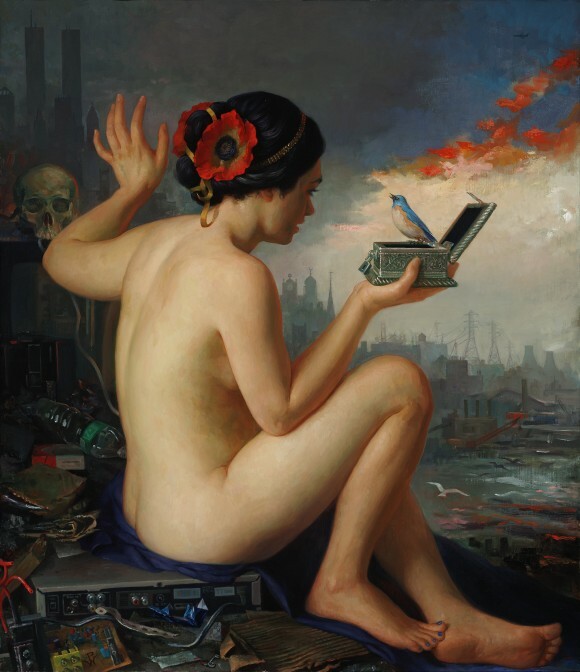 One of her more recent paintings, “The Sixth Extinction,” hangs in her studio space. It portrays Gaia, the ancient Greek mother-earth goddess, standing at the center, expressing patient astonishment. She is flanked by a calm-looking caryatid, supporting a cracked stone structure, and a distressed-looking water nymph, Naiad. A halo, doubling as a target, circles Gaia’s head. A drone flies in the sky. The cliffs in the background look like industrial ruins. Gaia’s right leg sports a prosthetic-looking armored boot, reminiscent of Joan of Arc. Watwood said it represents her concern for the environment and humanity being “on its last leg,” so to speak. Lately, she has been exploring the idea of how humanity has yet to reach a proper balance in regard to the use of technology and natural resources. “I like combining these classical figures with a contemporary, dystopian urban landscape, which is also just the world around me,” Watwood said. “I didn’t make it up, it looks like that.” The backgrounds of some of her paintings, like “Apocalypse Venus,” are based on photographs and drawings she made of the debris on Coney Island, in the aftermath of Hurricane Sandy. Watwood belongs to the first generation of artists trained in the academic ateliers that, starting in the mid-90s, strove toward rediscovering and passing on the high skills of historical masters. 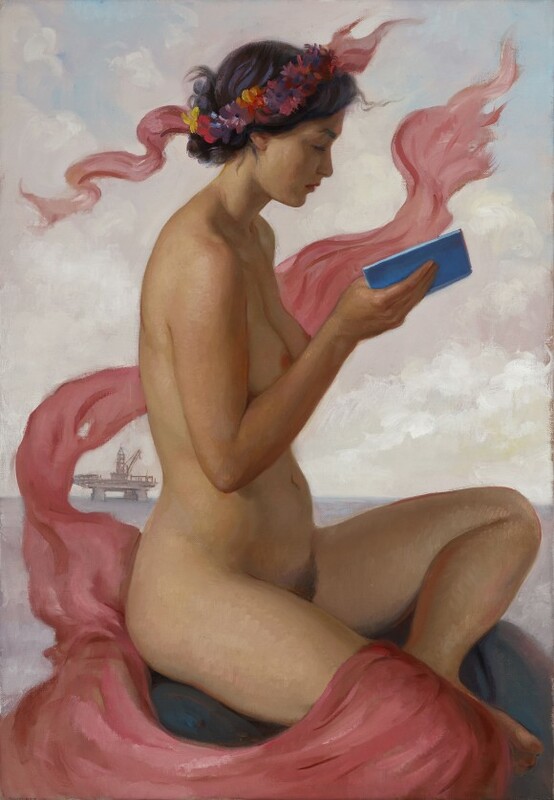 She calls her work “contemporary classicism.” It’s one of several genres of the realist and representational art world that has resurged in the past 20 years but has yet to fully enter the mainstream art market. “I am doing something that is a little bit different than some other artists who are atelier-trained,” she said. Though her draftsmanship is solid and her compositions carefully designed, she is not strictly focused on representing what she perceives as accurately as possible. She feels that if the image is too objective, viewers will compare it too closely to the world around them (like they would a photograph) instead of being able to enter into an imaginative, storytelling world. Watwood’s paintings are, visually and conceptually, like multilayered puzzles, enticing the viewer to slow down. It takes some time to unpack the meaning of the allegories and myths she creates, but that in itself is the raison d’etre for a fine artist like Watwood. “There are these deep core emotional messages that I’m trying to convey. That’s the fun thing about a painting. An artist can create these pictorial worlds for the viewer, who can then enter that imaginative space.” Watwood navigates a fine line between the reality of the present world and the reality of a world transformed into something wonderful and beautiful. She asks herself repeatedly what she wants to imagine and create for the future. “I think everyone feels this century might not be an easy one. There might be a lot of difficult challenges, whether environmental, political, or economic. Human beings have so much resilience and are capable of confronting difficult situations, as long as they have an imaginative structure of meaning—that your life has meaning, that the work you do has meaning, and that it will make a difference,” she said. Watwood grew up in St. Louis, Missouri. She studied scenic design at Trinity University in San Antonio, Texas. After graduating, she worked at the Seattle Repertory Theater in Washington state. Initially, she wanted to attend graduate school at Yale, with the idea of becoming a scenic designer on Broadway. The head of the design department at Yale School of Drama at the time, Ming Cho Lee, told her that she would be a strong candidate if she would hone her graphic skills, and he recommended that she study figure drawing at the Arts Students League of New York. “Little did he know that that little piece of advice was the end of my theater career,” Watwood said, smiling. She went on to study at the Gage Academy of Art run by Gary Faigin, who used to teach at the Arts Students League. Inevitably, she decided she loved to paint more than the idea of working on Broadway. At the Gage, she took a workshop with one of the main teachers and influencers of the atelier movement, Tony Ryder. “That was the beginning of my introduction of this whole world of representational painting and classical training that I didn’t even know existed,” Watwood said. Ryder inspired her to perfect her skills further. He suggested that she study either in France with Ted Seth Jacobs at Ecole Albert Defois, or in New York with Jacob Collins, who was just starting his own atelier. She chose New York. In 1996, she started to study at the New York Academy of Art for her master’s, as well as part time with Jacob Collins (who had also studied with Tony Ryder and Ted Seth Jacobs) at his Water Street Atelier in Brooklyn, the precursor to Grand Central Atelier, now in Queens. Now there are more highly skilled realist and representational artists around and a broadening appreciation for their art. Yet there are fewer galleries and art fairs representing and marketing them, and not many art critics are writing about them, either. “I do portrait commissions, and that really helps,” Watwood said. “It’s difficult for me as a somewhat established artist. I think it is extremely difficult for young artists,” she added. Even after becoming a professional artist, Watwood’s theatrical impetus and sensibility stayed with her. She enjoys painting on a large scale. The canvas becomes a stage, a tableau where she casts her characters, costumes them, and gives them props. “I’ll push the composition and style to suit my desire of what I want in the painting,” she said. In “Orpheus Playing for Persephone and Eurydice in the Underworld,”her largest painting so far (6 feet by 9 feet), taking up the entire wall of her studio space, she revisits the ancient Greek myth with a cast of characters plucked out of New York City. The theme is timeless. Orpheus’s music represents pure beauty, emotion, and tenderness that come through the experience of love, she explained. 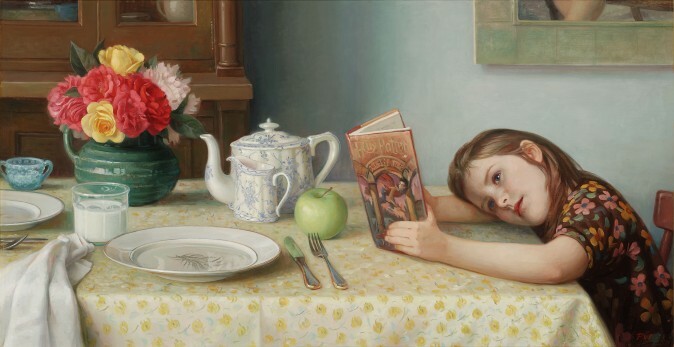 At one point, galleries were asking her to do more still life paintings, but Watwood has kept to creating figurative work. She continues to refine her artistic voice, which is a never-ending process. “I’ve always been very interested in portraiture and figurative work because it touches on the issues of being and of the soul. I basically think that we are spiritual beings having a human experience,” she said. “There are so many representational painters and so many different ways you could work. … How do you find your true north, your subject matter, style, and vision that is your own, that defines your own path and your own creative choices?” She has asked herself those questions during the main transitions of her creative process. Lately, she has been interested in Rubens and Tiepolo, the baroque and the rococo artists respectively, and Abbott Handerson Thayer, the American artist who depicted angels. 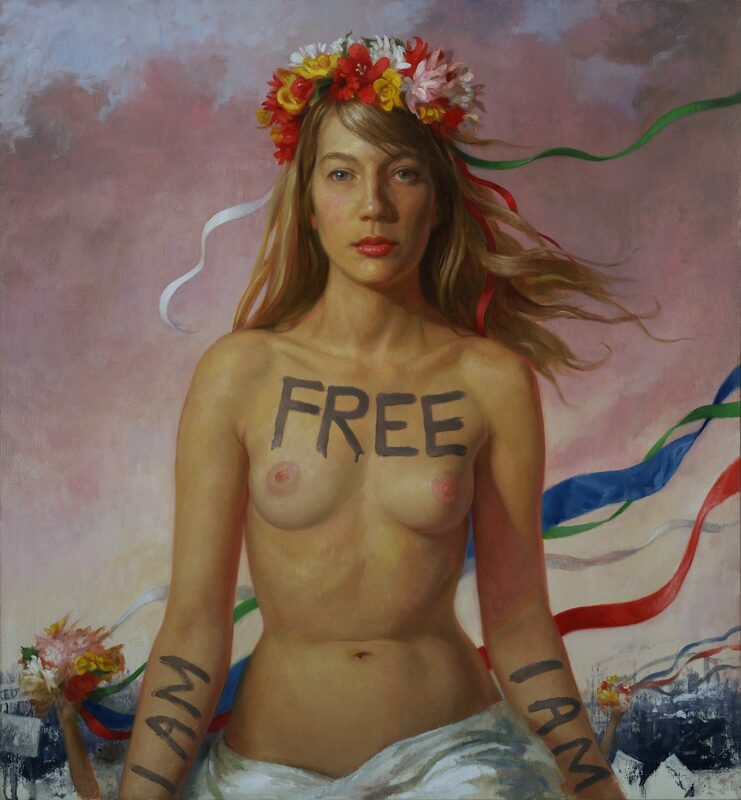 You can see their influence in the ribbons, swirling elements through the air in her more recent work, like her Sibyl paintings and her painting of a fallen angel. “In doing my best work, I always feel more like a conduit. The quality of that conduit is changed and transformed by your life, your experience, and what you are engaged with. As you go through your artistic practice, over and over and over again, you are constantly transformed and renewed,” she said.